A fine set of this 'truly monumental work of increasing scientific importance, not so much for its information on the diamond and its mining as for its detailed studies of the petrology and mineralogy of kimberlitic pipe-fillings. Such treatment of originally deep-seated mantle-derived rocks was well ahead of its time. The significance of Williams' studies escaped even himself, and certainly most others. The lukewarm reception accorded the book resulted in an issue of relatively few copies and the book is now difficult to find.' - Capt. John Sinkankas no. 7224. 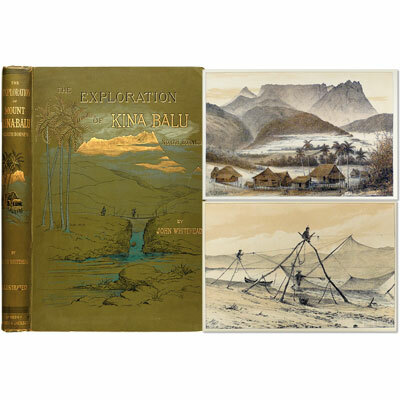 Two large volumes illustrated throughout, 31 photographic coloured plates, 306 black & white photographic plates, tables, maps and diagrams. ‘Williams (1812-1884) began work on this dictionary in 1863, taking almost 10 years to organize his 53.000 examples and phrases and 12.527 characters. Joseph Edkins contributed a section on 'Ancient sounds' in the introduction and was responsible for lists of 'Old sounds* inserted at the head of each syllable. ‘ - Lowendahl. British consular officer, sinologist and linguist, Sir Herbert Giles was highly critical of WIlliams’ work, publishing in 1879, a small work entitled ‘On Some Translations and Mistranslations’ in Dr. Williams’ Syllabic Dictionary…’. in which he states that ‘though in many ways an improvement upon its predecessors, is still unlikely to hold the fort for any indefinitely long period’ ingeniously though correctly ho goes on to say ‘It is indeed already felt by many that something more systematic in arrangement and more accurate in detail is wanted to meet the present extension of Chinese studies,’ it took Giles a further twenty years to compile his own dictionary. A finely bound copy with two hand written sheets of Chinese characters and one small map torn out of a magazine with annotations and markings of a route. There is also a letter tipped into the front from the Chicago Imperial Academy of Sciences, sent to L. Wilkinson, offering three Chinese dictionaries, listing by importance ‘the big one by Giles’ ‘at the price of £4.12.6’ ‘next to this in importance are the two following dictionaries’ ‘Wells Williams Syllabic dict- of the Chinese Lang.’ ‘Shanghai 1874’ £2.18.0’ and ‘Wells Williams Tonic dict. of Canton dialect’ ‘Canton 1856’ which was ‘out of print the price would be about 30/-’.